No one ever wants to come down with a bad case of the flu, especially when traveling. Unlike the common cold, which can be caused by over 100 different viruses, the flu is caused by one of 3 strains (Type A, B, or C) of the influenza virus. Using natural flu medicine, it’s possible to give your body the best chance to fight flu symptoms and get you feeling better fast. Unfortunately, the flu virus isn’t affected by antibiotics and only will respond to antivirals if given within 24-48 hours of first flu symptoms. So once the flu virus takes hold, your only choice is to wait it out, be miserable, and treat the unpleasant flu symptoms as much as possible. Let’s see what we can do to stop the flu before it finds a home. Flu Symptoms? Or is it a cold? One of the first things to determine when you start to feel bad is whether or not you actually have the flu. Cold symptoms and flu symptoms can be very similar when they begin…see the handy chart below to match yours. Now you know all the bad stuff a case of the flu brings with it, including fever, severe aches and pain that may last for several weeks, chills, and headaches. What can we do to avoid this unpleasantness altogether with natural flu medicine? When traveling, our bodies are already stressed to the max. Crowded airplanes, unsanitary taxis, and sometimes questionable hotel/hostel accommodations all greatly increase the chances that we’ll come up against one of those nasty flu viruses and not be able to fight it off. 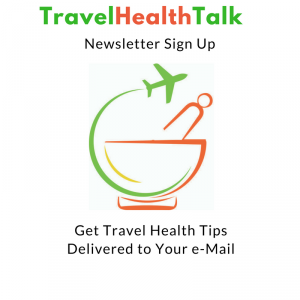 Here are a few tips on keeping healthy and avoiding the flu naturally while traveling. 1. Keep it clean. Wash your hands as often as possible. Touching the nose, mouth, and eyes is one of the most common ways the flu virus is spread. Travel-sized hand sanitizers and antimicrobial wet wipes are great for travelers. While they aren’t as effective on viruses, a quick wipe up of your airplane seat rests, computer keyboard, pens and tray table can go a long way to prevent the spread of bacteria and some viruses. 2. Boost your body. 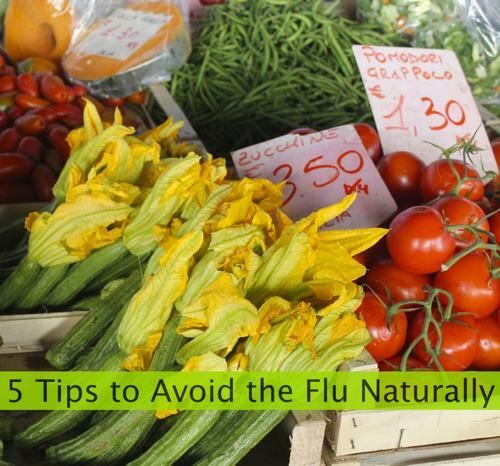 Natural flu medicine allows you to fight the flu with the food you eat. Traveling can be tough on the digestive system, so keeping it simple with a good variety of fresh fruits and vegetables is essential. The more colorful the better! Colorful foods are usually highest in immunity-strengthening antioxidants. Fruits and veggies high in important vitamin C include oranges, red/green chili peppers, fresh kale, kiwi fruit, strawberries, and papayas. 3. Get plenty of sleep. Often when traveling, our body clocks get all out of whack. Jet lag and sleep issues can quickly bring down an otherwise health immune system and set us up for the flu virus to come in. Shoot for 8 hours of uninterrupted sleep if possible and your body will thank you for it. See Beat Jet Lag more tips on how to come out ahead of this pesky traveler’s affliction. 4. Walk it off. Even mild exercise for 30-60 minutes each day can give your body’s immune system an extra kick. Take a brisk walk or a long run. 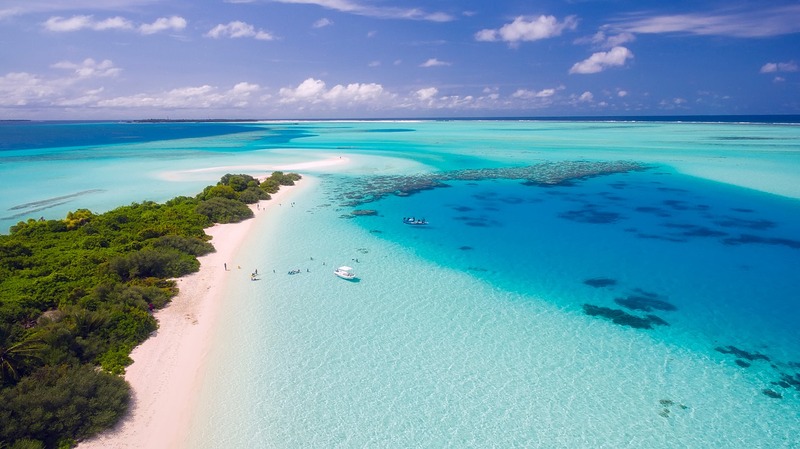 Not only will you be seeing your new destination through different eyes, but you’ll be giving yourself more muscle to fight the flu. Exercise also relieves stress quite effectively and we all know traveling can be a very stressful experience at times. 5. Enjoy a cuppa. What better way to put your immune system into first gear to avoid the flu than to enjoy a cup of soothing tea? Simple ingredients like fresh lemon juice, ginger and honey added to a cup of green or black tea boost the body’s resistance to flu viral invasion. Decaffeinated green teas help keep the body hydrated and flushed as well. The warmth feels so good going down! As with all medical conditions discussed on the Internet, check first with your doctor before using any alternative treatments. 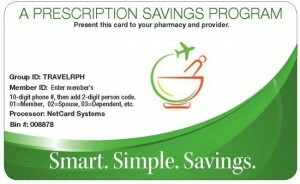 Pharmacist Addendum! 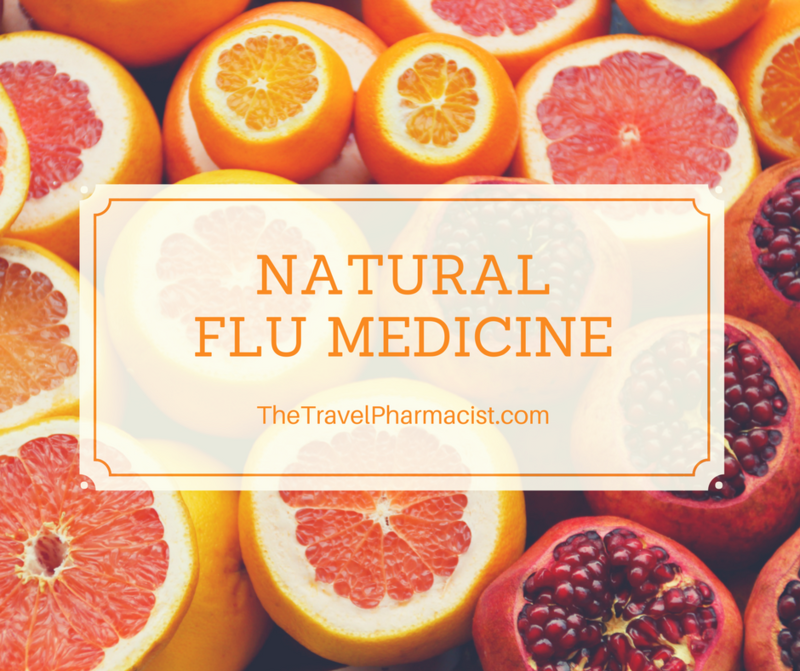 Natural Flu Medicine is a wonderful way to boost your body’s ability to ward off and fight the flu virus, but it should never take the place of getting a yearly flu shot. Over 36,000 people a year die in the United States alone of the flu – it’s a very serious and often preventable illness. Avoiding the flu naturally is an additional way to stay healthy, especially when the flu shot may not cover all virus strains – but the flu shot should always be a first choice! This is great, Lisa. Now if only I could sleepwalk with a cup of veggie tea I would be sterling. Great tips. I do all these things…except for sleeping well. I only sleep about 6 hours a day even at home. So I have natural sleeping aids like melatonin and 5htp. And my cuppa is of chamomile tea with vanilla and honey! I rarely have a cold and I’ve never had the flu after I migrated to America. And no flu shot either. Very timely tips! I know many people who have been down with the flu this season. I take echinacea most of the winter. Especially before, during, and after trips as I find that’s when it’s easiest to pick up germs. Frequent and thorough washing of hands is also key to remaining healthy. Great suggestions all! And always, when in doubt, have a cuppa’. 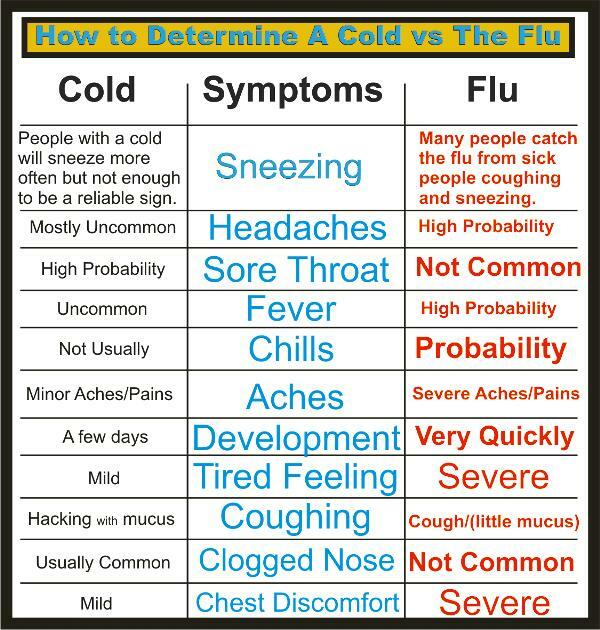 That chart comparing cold symptoms and flu symptoms is very helpful! My husband thought he had the flu, but I can see from your chart that it was just a cold, i.e. “man flu.” LOL. Cold and flu are common at the time of traveling to a new place. We should conscious about attacking the risk of this virus infection. These above mentioned 5 Steps of Natural Flu remedies are awesome. I really follow them during a visit to the new place for traveling. Hi Jennifer! I’m so happy you found these tips helpful! Thanks for stopping by!